Easter, Happy and Blessed Event, where did we get its name? derived from Eastre, Eostre, Eostur, or Ostara? and she called his name Asher. The Hebrew text uses three almost identical words in the above passage. 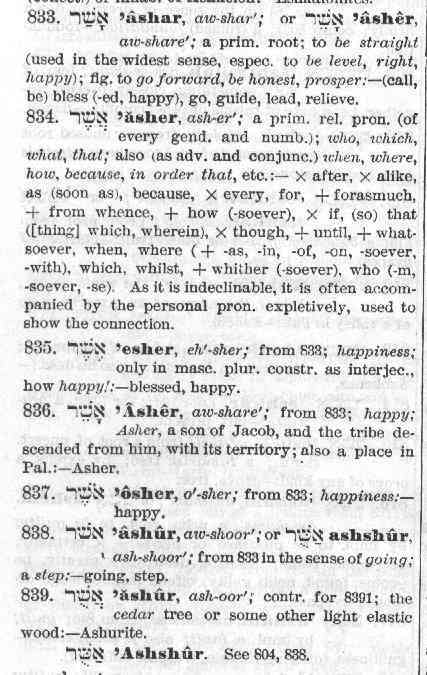 Strong's #837 'osher - "Happy"
Strong's #833 'ashar - "blessed"
Strong's #836 'Ashar - "Asher"
Per Strong's "Hebrew and Chaldee Dictionary", from #833 came #836, #837 and the more often used form #835. #835 ('esher), which Leah did not use, is used 43 places in the Old Testament Scriptures and is either translated blessed or happy. While we are quite sure that it was a very blessed and happy event for Leah, the subject of this small write up will be a more earth shattering and blessed event, the resurrection of our Lord Jesus Christ. You ask how do we get from Leah to the resurrection! The answer is in the meanings and soundings of the Hebrew words. For we as Christians can think or no more blessed and happy event than the resurrection. Many scholars have written that the Christian celebration of Easter was a convenient borrowing from the ancient pagan ceremony of Eastre, Eostre, Eostur, or Ostara. (see Appendix). Let us take a closer look at other possibilities for the name of the Easter celebration! Isaac E. Mozeson in his book "The Word" (Shapolsky Publishers, 1989) on page 23 under the topic "ASIA / AYSH" has the following. "ROOTS: ASIA is pronounced much like the Hebrew term ASH (fire-Deuteronomy 4:24). Dr. Shipley's "Dictionary of Word Origins" (p. 144) cites an ancient Assyrian marker inscribed Asu, "land of the rising sun". We call this land mass Asia, and the direction of the fiery sunrise we name EAST. Adding the Hebrew letter Reysh (adding the r sound) after the 'Aleph and Shiyn we get our family of words #833, #835, #836 and #837, with #833 and #837 being the "Happy" and "blessed" in Leah's statement. We are most interested in #835 which is pronounced eh'-sher and is translated as either blessed or happy. #837 is pronounced o'-sher. They are sound a like words for Eastre, Eostre, Eostur, or Ostara, the names of the "ancient pagan festivals" which the early Christians supposedly adopted as a means to celebrated unnoticed in ancient pagan times. See the extract from Strong's below. Conclusion: It is proposed that early Christians who had a good knowledge of Biblical Hebrew when the concept of celebrating the resurrection was being formed would be very comfortable with the name of Eostur or Eoshur or Eostre or Eoshre for the celebration of the Lord's resurrection, whichever form was used in the early days before it became the more modern Easter. It is truly a most blessed and happy celebration! Of course the Christian would know the true meanings even if it did sound similar to and was being celebrated at the same season as the pagan celebrations! Note also that the parent word, #833 - 'asher', also has a meaning of being right or leading in the right way. Per Mr. Mozeson, "More English words can be clearly linked to Biblical Hebrew than to Latin, Greek, or French." The name of this festival, itself, shows its heathen origin. "Easter" is derived from Eastre, or Eostre, the Anglo-Saxon Goddess of spring and dawn. There also is some historical connection existing between the words "Easter" and "East," where the sun rises. The festival of Eostre was celebrated on the day of the Vernal Equinox (spring). Traditions associated with the festival of the Teutonic fertility Goddess survive in the Easter rabbit and colored eggs. Spring is the season of new life and revival, when, from ancient times, the pagan peoples of Europe and Asia held their spring festivals, re-enacting ancient regeneration myths and performing magical and religious ceremonies to make the crops grow and prosper. As the festival of Eostre was a celebration of the renewal of life in the spring it was easy to make it a celebration of the resurrection from the dead of Jesus. There is no doubt that the Church (of Rome) in its early days adopted the old pagan customs and gave a "Christian" meaning to them. [c] The Pagan origins of the holiday according to a Venerable Bede, English historian of the early 8th century, the name Easter, like the name of the days of the week, is a survival from the old Teutonic mythology. According to Bede it is derived from the Norse Ostara or Eostre, the Anglo-Saxon goddess of spring, to whom the month of April, and called Eostur-monath, was dedicated. The Greek myth, Demeter and Persephone, with its Latin counterpart, Ceres and Persephone, conveys the idea of a goddess returning seasonally from the nether regions to the light of day. This is in conjunction with the festival of spring, or vernal equinox, March 21, when nature is in resurrection after winter. Is Easter a pagan festival? Easter, is it a pagan festival?